(NC) A favourite holiday activity for many of us is baking, but between gift shopping and get-togethers, it’s hard to find the time. In fact, a recent survey by Becel found that one in two Canadians want to bake more during the holidays, and 77 per cent would spontaneously bake to celebrate with family and friends. So why not get your loved ones together for a cookie swap? This fun fest is the perfect way to share favourite recipes, while leaving each guest with enough treats for their upcoming festivities. 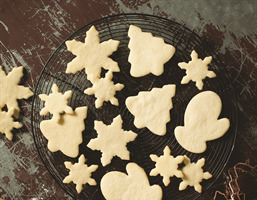 The sugar cookie is a classic recipe for the holidays and is sure to be a crowd-pleaser for both young and old. Beat margarine sticks with 1 cup (250 mL) sugar in large bowl with electric mixer until light and fluffy; about 2 minutes. Beat in eggs and vanilla until blended. Gradually add flour and beat on low speed until blended. Divide dough in quarters; wrap in plastic wrap and flatten into disks. Refrigerate at least 1 hour or until firm. Preheat oven to 350°F (180° C). Remove plastic wrap from dough. Roll each quarter about 1/8-in. (3 mm) thick on floured surface with floured rolling pin. Cut dough into shapes with 2-in. (5 cm) cookie cutters. Arrange on ungreased baking sheets, 1 in. (2.5 cm) apart. If dough becomes too soft, return to refrigerator to firm up. Sprinkle with remaining 2 tbsp (30 mL) sugar. Bake 10 minutes or until edges are just golden. Let stand 1 minute on wire rack; remove cookies from sheets and cool completely. Decorate as desired.